John Kenneth Muir's Reflections on Cult Movies and Classic TV: Breakaway Day 2018: "Force of Life"
This episode of Space:1999 sees a mysterious ball of energy - an alien life-force - infiltrate Alpha. In particular, the alien focuses on Nuclear Generating Area Three and Technician Anton Zoref, played by Ian McShane. Before long, to the dismay of Anton’s loving wife, Eva (Gay Hamilton), the technician begins to change. 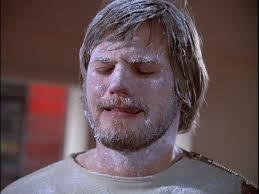 In particular, he can’t seem to stay warm. By seeming osmosis, he begins to drain all the heat from a lamp in his quarters, then a lighting panel in a corridor, and so forth...his appetite for energy and heat ever-increasing. Commander Koenig (Martin Landau) and his team, including Victor Bergman (Barry Morse) and Dr. Helena Russell (Barbara Bain) register the energy drops, but don’t yet realize Zoref is the cause. Before long, Zoref is seeking to stay alive (and warm...) by draining the heat from living human beings: his fellow Alphans. Koenig and the others catch on, but not before Zoref marches right into the Nuclear Generating Area and absorbs its heat...causing a tremendous explosion on Alpha. Out of the smoldering rubble of the devastated nuclear plant, the energy sphere re-emerges whole -- stronger than before -- and heads off into space, no doubt carrying remnants of Zoref with it. "Force of Life" is my favorite episode of Space:1999 (1975-1977). I am nostalgic about the series and many episodes, and I also have tremendous affection for "Dragon's Domain." 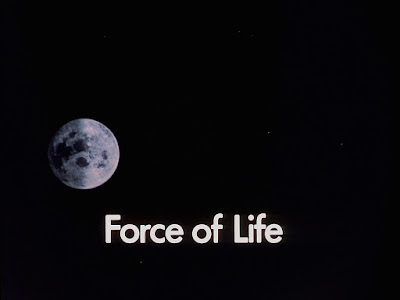 But "Force of Life" is a perfect representation of the series format, in my opinion. 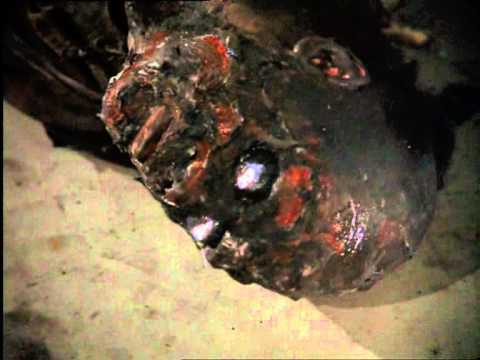 Specifically, the episode makes no bones about the fact that the Alphans don’t understand a lick about the alien that has come knocking on their doorstep. These are not the knowledgeable, highly-evolved humans featured in many popular science fiction series. They are people like us, in search of answers. "We’re living in deep space, there are so many things we don’t understand," she says. "We don’t know what that alien force was, why it came here, or why it selected Anton. But we’ve got to try to help each other understand..."
In other words, the episode perfectly reflects the essence of our human condition. There are things in this universe we don’t understand -- fate, life, death, you name it -- but what we can do is reach out to other humans in pain; provide comfort and succor. For me that’s a very human and touching message in what is otherwise a spine-tingling episode with a hard-edge. 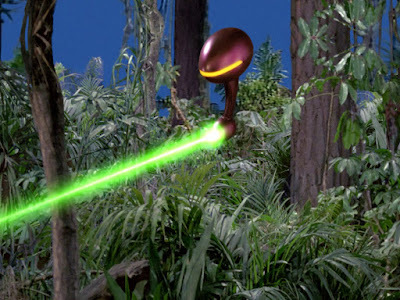 For an example of the latter quality, I need only recommend you to the scene in which Astronaut Alan Carter (Nick Tate) fires his laser at Zoref and chars his skin off. Completely. This was not something a five year old kid expected to see on television in 1975. Some folks, including the late great Buster Crabbe, just didn’t like "Force of Life," and that’s certainly their right. Back when Space:1999 was on the air, he complained about the episode on a talk show in which the other guest was series star Martin Landau. Mr. Crabbe wanted to know what the alien was, what it represented, and what the whole episode meant. But of course, that would have spoiled the fun if everything had been explained. Then we wouldn't have gotten the alien life-form as a mirror for all the great unknowns of human life. Better, isn’t it, to leave some things unclear; to allow the viewer to fill in the gaps? Think of Hitchcock's The Birds. Would any explanation really satisfy you as to the reason for the avian attack on humanity? The same holds true for "Force of Life." The motives of the alien are...alien. "It was a process of a life force traveling through space, chrysalis into butterfly. That’s entirely all it was. Why can’t people see that? Just last night, I was watching this program about the universe, about the incredible ways life can survive. These scientists study these tiny microbes found on Mars, or learn how life can survive literally anywhere. It’s incredible. I didn’t know about these things when I wrote "Force of Life," but it is the same thing. The life force had its own agenda, and there were no philosophical discussions to be had. It couldn’t express itself verbally, because it was very different from the Alphans. I mean, was it going to pop in and say ‘charge me up and send me on my way’? That would have been ridiculous." 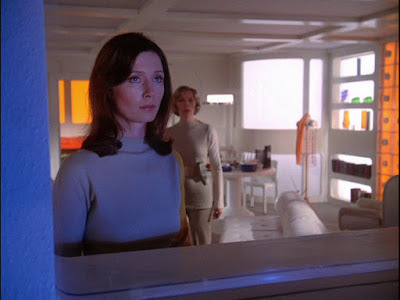 "The Alphans didn’t understand the process," Byrne continues, "but remember, we weren’t dealing with super smart space jockeys, we were dealing with near-future people caught in a very un-Earth-like situation. But the process was purely that of the caterpillar transforming into something else." Beyond the interesting story, "Force of Life," is worthy of spotlighting because of its startling visualizations. 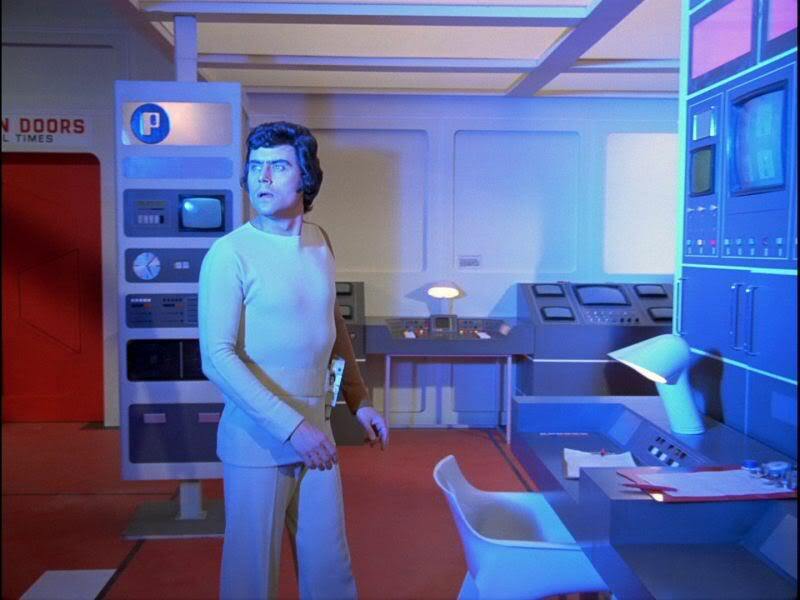 I’ve always loved Space:1999 because it is a TV series that adroitly manipulates film grammar, and in the process cogently transmit its themes. It is a visual masterpiece dominated by mind-blowing imagery. David Tomblin directs "Force of Life" with a quiver full of stylish film techniques including a tracking camera, slow-motion photography, distortion lenses, and most famously of all, a slow turn of the camera into an inverted position. The aforementioned upside-down camera turn -- the final shot of the episode’s shocking teaser -- is efficacious because it symbolically and visually suggests that Moonbase Alpha will be turned on its head by the alien energy force. Even more effectively, the use of extensive slow-motion photography in the chase sequences prolongs the terror of Zoref’s victims, and heightens audience suspense. The menacing low-angle shots of the technician stalking his prey also contribute to the episode’s overall feeling of dread and paranoia. These moments - which fill the screen with the imposing image of the homicidal, starving Zoref - depict strength and the invincible nature of this alien intruder. The color changes and focus shifts on Zoref’s face further reflect that this human is in the grip of an alien force by alternating dramatically from blue to red (symbolically cold to hot...) as Zoref drains his victims. All of these remarkable and stylish touches make "Force of Life" appear more like a full-fledged feature than a TV show. As in the best of productions, form reflects content. This isn’t just a pretty melange of master-shots/close-ups, but a clearly-thought out tapestry that carries distinct visual meaning and thus thematic weight. "The way it looked took some thought," Johnny Byrne told me, "and was beautifully expressed by David [Tomblin]. I don’t understand why people don’t get it..."
I must say, I also like the little joke about Zoref’s name, which Byrne insists was unintentional. Jumble the letters around a bit and you spell the word...froze. Nice touch. 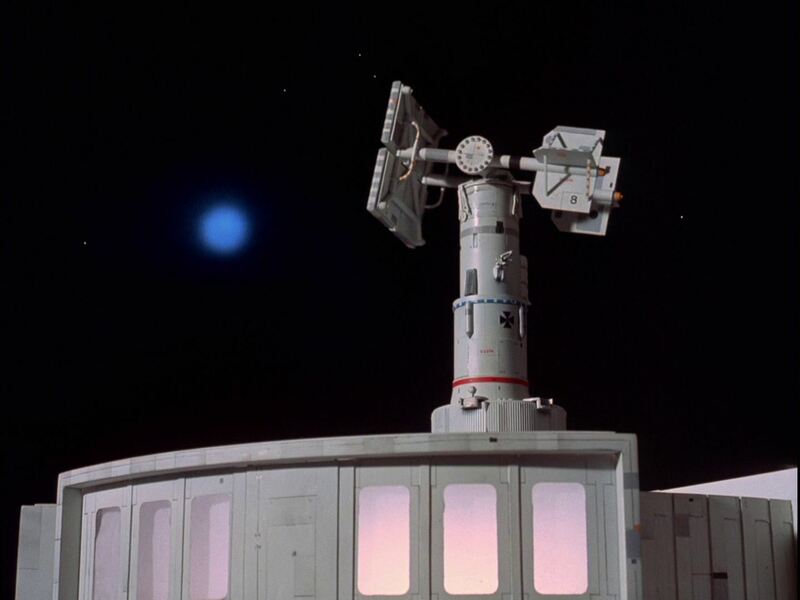 The essence and driving concept of Space:1999 is always that outer space is a realm both frightening and wondrous, so unlike the series' detractors, I believe it totally unnecessary to explain where the alien in "Force of Life" originated, how it thinks, why it selected Zoref, where it’s headed, and so forth. If all those questions had been addressed, the mystery would vanish, murdered in the rush to find an authentic-sounding scientific explanation or some pat psychological motivation for something that -- to the Alphans -- should remain inexplicable. There would be no room for horror, no space for awe, and thus no sense that the Alphans are strangers in a strange land. And that's the very thesis of the program. "Force of Life" delivers that thesis in near-perfect format. So today, I wholeheartedly champion Space:1999's ninth episode, "Force of Life." It credits the viewer with intelligence, and doesn’t rush to spoon-feed us every last detail. In its deliberate ambiguity and impressive technical skill, it represents a remarkable installment of an often misunderstood or underestimated TV series. After you watch it, you might look up at the stars and shiver. There are things up there we can’t even imagine, and every now and then science fiction TV programming has a duty to look beyond laser duels, tales of good vs. evil, or even metaphors for our political world, and focus instead on the universe of mystery inherent in the cosmos. That’s precisely what "Force of Life" accomplishes, and the genre is stronger for it.